Restaurant Managers can record Employee Notes that will be listed on this tab. Employee Notes can be for a myriad of reasons such as 'No Show', 'Late for shift', 'Exceptional Service' etc. This tab displays all the Locations where this Employee record exists on a POS. 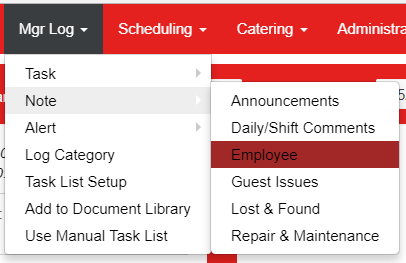 This tab is used in the Scheduling module to help the Restaurant Manager or Scheduler determine when to schedule the Employee. This is where you specify the general availability for the Employee for each day of the week. Options are 'Available All Day', 'Unavailable All Day', or specific start and end times of availability. Setting this won't prevent the Employee from being scheduled at these times but they will show up on the schedule as a visual flag for the scheduler to take into account when assigning shifts. On this tab you can see and manage which Jobs are assigned to this Employee. To add a Job, select it from the fields above the grid and click 'Add'. To remove a Job click the Delete button (trashcan icon) on the row you want to remove. This also has a Rating field. The rating is used in Scheduling so that you can set that a specific shift must be filled by an employee with a certain rating (i.e., only 4 star or above Bartenders can work the Friday night shift). You can use this to limit the possible employees who can work that shift based on the rating. Ratings can be easily managed by clicking the appropriate stars on the row next to each Job. Star ratings are not visible to Employees, but are visible to the 'Scheduler' role. This tab shows which Job Responsibilities this Employee has. You can add them by selecting from the dropdown above the grid and clicking the 'Add' button and can remove them by clicking the trashcan icon on the row you want to remove. Job responsibilities allow you to break a Job down into more detailed responsibilities/qualifications/certifications. You can then assign these Responsibilities to only certain Employees. When creating shifts in Scheduling you can specify what responsibility the Employee must have in order to fulfill that shift. This will limit which possible Employees can be selected.